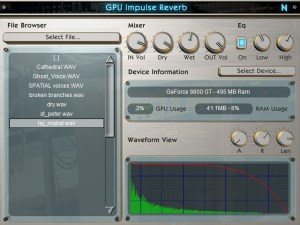 GPU Impulse Reverb VST is an effect plugin that calculates convolution reverbs by using your graphics card as DSP for realtime reverb calculation with a CPU usage of near 0%. Any consumer graphics card that supports OpenCL (NVIDIA / ATI or others) can be used without any need for other specific hardware. All common VST hosts are supported, such as Cubase, Nuendo, Reaper, Fruity Loops and others. A public demo is available, free to try for everyone. See the demonstration video below to get an impression of what it can do for you. I am installing the demo as I type this. PLEASE, PLEASE keep me up to date with a full release. You have my utter respect and praise for this. Excellent idea. Really am impressed! I hope everything works well with the demo. If you have problems, don’t hesitate to contact me. The full release can be bought on the “Buy” page in the top menu. If you don’t mind, I’m always interested in the setup that is used to try it (used GPU, used host and such). Are there any plans to release a windows RTAS version? 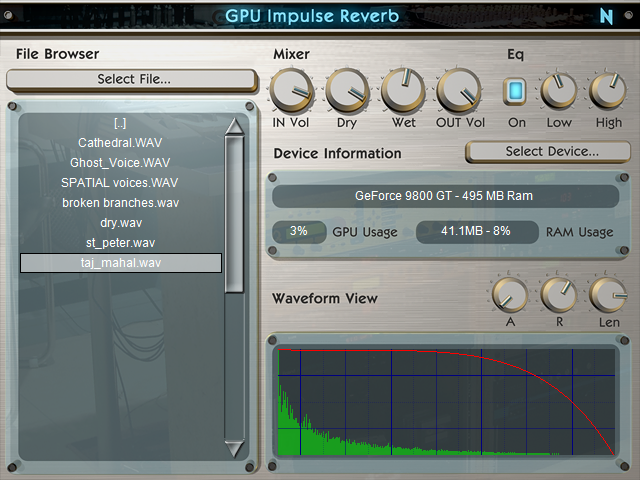 Or have you tried it with the Fxpansion VST-RTAS wrapper? If I ever have the money to buy ProTools there would be a native RTAS version, too. Please make a GPU EQ & Compressor also ! Are there plans for an OSX version? I am a C++ student with audio programming aspirations. I DL’d your IR tonight and will try it out. I am adding CUDA to my learning path and installed Parallel nSight last week to use in VS. Would love to know if there are any advice/pointers you can give me in adaoting CUDA to audio apps. You’ve got to love the fact that this technology is not being widely adapted yet and there is room to develop something cuting edge here. Tried the demo, and found it very easy to use as it has a good clean interface with nice sound tweaking features.The quality of sound is peaking the overall experience. It’s a great concept of running the process by the power of the GPU. I’m buying this! Not only does this take strain off your GPU but it’s one of the best reverb plugs on the market, no doubt. The humble 310m nVidia GPU in my laptop rarely even goes over 20% usage with this plug. Awesome stuff! You’d be a fool to not at least give it a try.